I’ve been waiting to write an update on Oh So until after what turned out to be a nightmare dealing with strangles was over. His gutteral pouch pain got better after we switched him to SMZs, and he was seemingly on the mend after a month off. Then he started swelling in his throatlatch area and abscessed out of his lymph nodes, which the vet thought might happen. She took a sample of some of the pus before it was ready to burst during his follow up appointment in February, and we thought all was fine from Thursday through the weekend. Then the following Tuesday, after the abscess had burst, she called to say he tested positive for strangles. WTF?! It took more than two months to find him, but I’m excited to introduce everyone to The French Bear, or “Bear”, my new project horse. 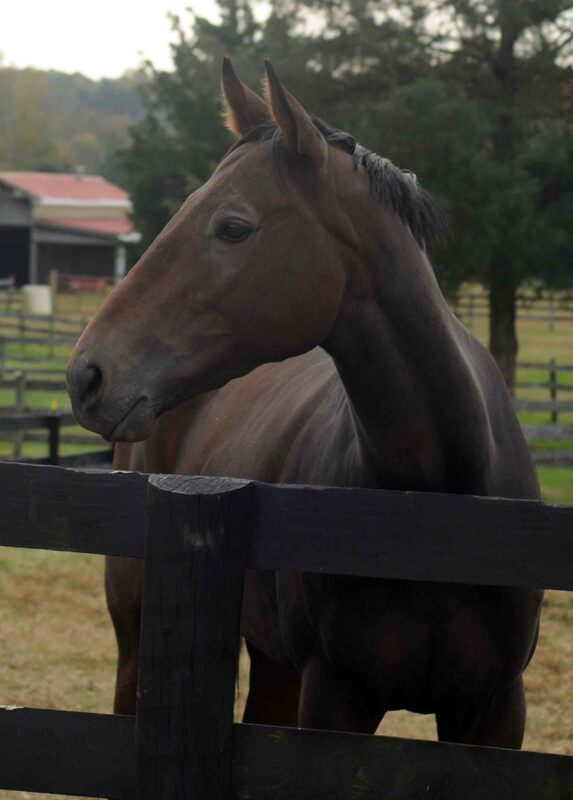 Lisa found him for me via Diana McClure of DMC Carousel Racing Stables in Berryville, Va.
Bear is a 2010 bay Thoroughbred gelding (Gators N Bears–Femme De Diable, Devil His Due). 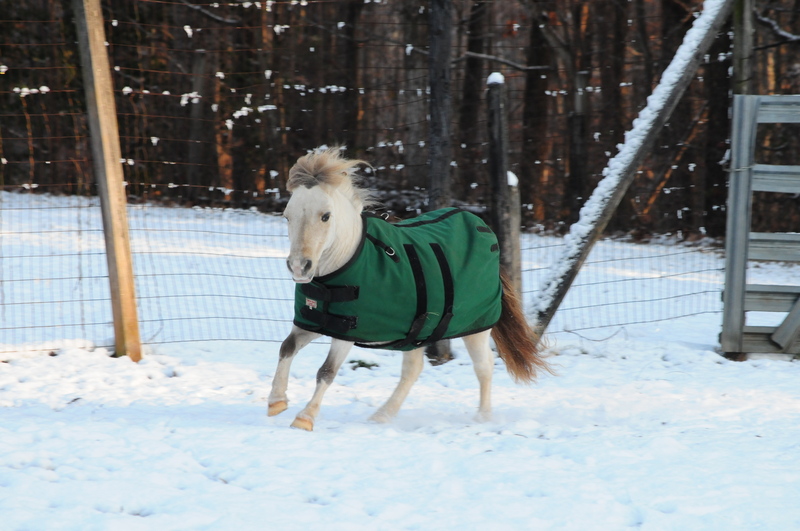 He raced 16 times this year and was about to race again when Diana convinced his owner to sell him. According to Diana, who also broke him, Bear tried very hard on the track, but his best wasn’t good enough. He never won, but he did get several thirds and won about $16,000. I brought him home last Wednesday and Oh So was immediately jealous, of course! I gave Bear Ace for the first few times in turnout, but he was fairly quiet. I put him out with Sam this weekend and they seem fine together. Sam actually seems uninterested, maybe because he doesn’t want to deal with a “kid” in his old age! Bear seems independent and happy to graze away from him, but he didn’t like being in a paddock by himself the first two days, so that’s when we decided to put them together. Sam’s enjoying his new buddy. tried to mount! Thankfully, he just stood there, but I clearly need a different girth or a different saddle. I’m looking into a more narrow saddle, but I wasn’t expecting to have this expense. He’s so narrow right now though, so we need to find something. He’s about 16 hands, but I think he’ll grow a bit more. Our second ride started well enough, but then he started being a bit nappy by the gate. A dressage whip helped, so that’s our new tool! I’ve been walking and trotting him over poles and working on very large circles. On Tuesday night, I had my first lesson with my dressage trainer, Nicky. We started with some basic lungeing, which he knows, but we added an outside side rein. He was very good to the left, but to the right, he was a little reluctant and kicked out a bit when she asked him to go forward. We ended it on a good note though and then got on. The first thing Nicky noticed was I need to define exactly where I’m going with him, instead of just trotting around the ring on big circles and straight lines. She said I need to decide which letter I’m turning in and think of square turns for a while so he doesn’t learn to fall in and so he learns to listen to both my leg aids. We worked a little on dropping my weight into my inside seat bone when turning and she gave me a tool to get him to move forward past the gate instead of stopping and refusing to turn right, which is the only direction it occurs. She wanted me to prepare for the disobedience by lowering my inside hand a bit, then wave the whip, which would be in my left hand, near his shoulder so he sees it. That seemed to correct the behavior, so we’ll keep going with that! I’m excited and a little nervous to start with “raw clay”, so-to-speak. I’ve never had a horse so green or young, and Oh So was my first OTTB, but he already had his basics on him and was jumping small things. I think Bear’s willing attitude will make it a lot more fun. He seems intelligent and willing to try things and I think he’s a real cuddlier, a bit different than Oh So for sure! He actually enjoys being groomed and doesn’t fidget, and he doesn’t try to kick my teeth out when I put on his blanket. I’ll be sad when the time comes to sell him, but I can’t afford to keep and compete two horses at once. I think we both have a lot to learn from each other. I’ll try to update the blog whenever I can with some videos and/or photos after my lessons. This fall has been kind of weird for me. On the one hand, I’ve been traveling so much that I haven’t had much time to miss riding, but on the other hand, this is the longest I’ve ever gone without riding regularly in my life and I still just feel a little lost. I never thought at the beginning of the year that I’d be bringing home a new horse and taking on a challenge like this. friends and trainer at VA Horse Trials. I’ll be missing VA for the first time since I can remember, but it gives me a chance to go to Galway Downs instead, so I’m excited about that. I’m just really missing the competition season. I won’t be able to get to a lesson with Lisa until next weekend, but I think it’s good for Bear to have a few weeks to settle before we put him back on the trailer. ended up getting some decent hunter people to talk with, which was a what I was worried about. 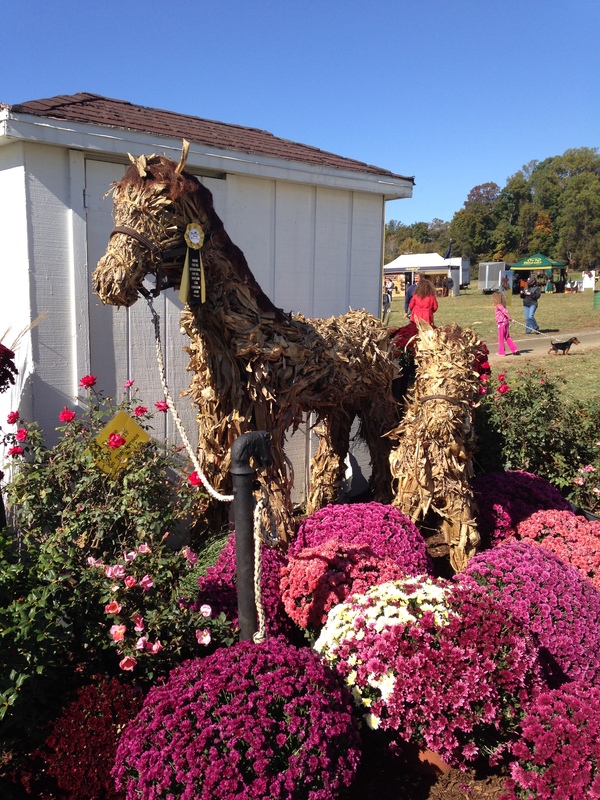 A Corn Husk horse at Fair Hill. 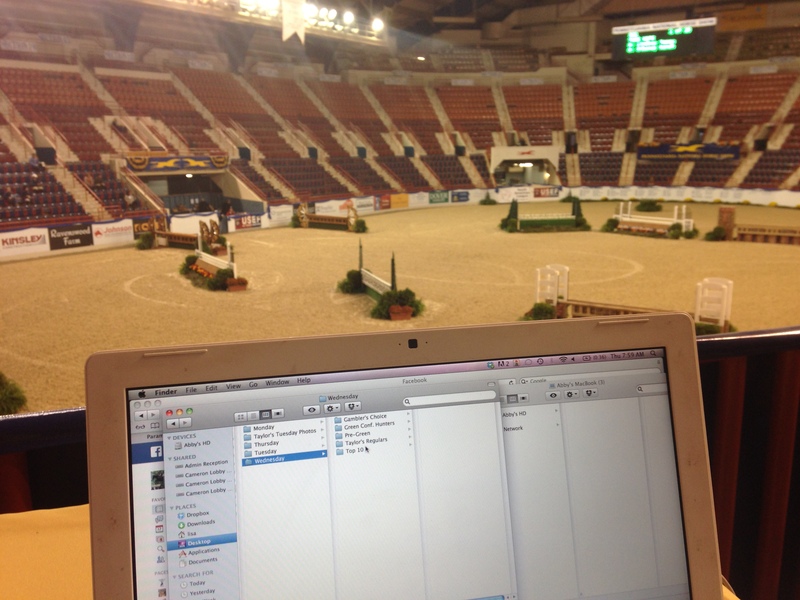 Check out our Pennsylvania National Horse Show coverage. We drove over to Fair Hill for a few hours on Sunday and although I was disappointed to miss cross-country, I was glad just to be there and be outside for a bit after a week indoors. On Sunday, I went to see Cavalia with my mom at National Harbor, which was a lot of fun. We went to see it a few years ago and really enjoyed it, and this show was similar, but with a little bit different theme. I really love watching the acrobatics. It’s basically like Cirque Du S’Olei with horses. Toppers and Rocky had a fun trip down to the vet on Thursday so Toppers could have a couple of teeth removed. Rocky went for moral support and so I wouldn’t have to deal with him screaming at home while simultaneously dealing with a new horse and Oh So on stall rest. The surgery was successful and the vet even gave us his two teeth, one of which was rotted and the other fractured. They shared a stall at the clinic and apparently Rocky tried to help by pulling out Toppers’ catheter! Now I’m off on my final trip for COTH this year, Galway Downs in Temecula, Calif. I’ve been to one event in northern California as an intern, so I’m excited to see some SoCal eventing. I’m flying into San Diego, and I wish I had some time to check out the city, but I have a pretty packed few days. I’ll be flying home on Monday, then heading to day 2 of the William Fox-Pitt clinic at Morningside in Warrenton where I’ll cover it for our website. Yes, he’s filthy, I know! I’m coming to the end of my winter break and head back to work tomorrow. It’s been refreshing to have some time off, ride in the light and wake up knowing I have the whole day at my leisure. Unfortunately, at the beginning of my break, my jump trainer called to say she had a family emergency and wouldn’t be teaching until after the new year. I was disappointed to have alot of time off and not feel productive with my jumping, but come the new year, we’ll start back fresh. My break started by sitting through horrendous traffic on the Beltway on Dec. 21 so I could see my favorite band, Go Radio, at The FIllmore in Silver Spring, Md. There weren’t that many people there, which was surprising for a show put on by DC101, but it made for a nice, intimate feeling, even on the bigger stage. I did photos for avoidthescene.com, and those are up now on my Flickr page. On Sunday, I had a really good flat lesson with Oh So. He was quiet enough that we could school some walk-canter and canter-walk transitions. My trainer brought her young horse over to school him in a different arena, so that made for some excitement. On Christmas eve, I went to see Lincoln with my parents. It was a bit slow and talky, but I can see why it will probably win every Oscar. My mom decided she didn’t want to go to church that night, which makes it only the second time in my life that we’ve missed Christmas Eve service. It’s the only time every year that we go to church, but I think we were all missing my brother, who spent Christmas with his fiancee and her family in Ohio. Christmas morning was sort of a non-event without my brother there. It took us all of a half hour to open our gifts, then my mom and I went for a hack. I did get some pretty cool stuff though. I had been wanting a new lens for shooting concerts and I got a 24-85mm f/2.8, which is really exciting. I’ve pretty much been shooting with just my 50mm f/1.4, but now I have the flexibility of a zoom too. I also got a nice set of different flavored hot chocolates to try. I’m not a coffee person, so I’m excited to take these to work. Throughout the break, I also got a chance to clip Rocky again and work both him and Toppers quite a bit, which I’m not so sure they appreciated! 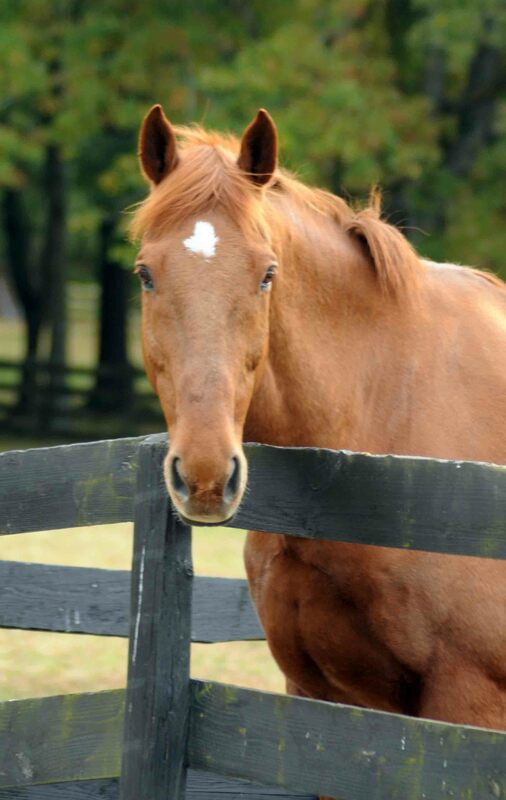 Toppers in particular was looking and feeling quite good for his 21 years! On Wednesday, we had pretty awful rain, so my dad and I went up to DC to go to some museums. I usually don’t have the time or energy during the year to go, so it was nice to spend a day not doing horse stuff. We went to the Museum of the American Indian first to see the “A Song For The Horse Nation” exhibition. COTH featured a couple of pieces from it in a recent issue, so it was cool to see the whole thing. We also went to the Air and Space museum briefly and the National Gallery, which had a really cool Roy Lichtenstein exhibition. Thursday was jam-packed with another flat lesson on Oh So and one on Sam. He was good again. We worked on some trot lengthenings and lateral work with minimal tension, which is a win in my book. I haven’t done lessons on Sam regularly for awhile since he’s not consistently sound, so it was nice to have a few reminders on my position and his pace. I tend to lean “at” him a bit since he warms up quite stiff and high-headed. We worked on some counter leg yields and leg yields in walk and trot with more bend than usual to help free up his shoulders, and to my surprise, he came nice and round and got steadier in the contact. That afternoon, my dad came with me to a travel agency in Fredericksburg so I could start planning my trip to Ireland next year. I came home with quite a few brochures and a lot to think about, but I’m really excited to start researching. Thatnight, I took my dad to see The Hobbit in 3D since he’s never seen a 3D movie. I probably should have watched the entire Lord Of The Rings trilogy first to refresh my memory, but I thought it was pretty good, and now I have to wait an entire year for the next one! Friday I spent most of the day outside working all four horses. I had a good jump school with Oh So on my own. I just set up some fences with canter poles before and after them and a few small gymnastics, and he stayed nice and steady and waiting. It’s often a challenge to jump at home because our ring is smaller then the places we usually go, so setting up gymnastics is usually better for both of us. Yesterday and today were just more of the same. After working everyone each day, I’ve been working on little things that need to be done, but I keep putting off- fixing my music website, cleaning my room and closet, organizing my computer, etc. Now I’m off to work for one day, then off on New Year’s Day, and ready for whatever 2013 brings. I feel like I should be posting more, but since life has slowed down a bit, I haven’t been too inspired. I have a hard time making myself sit down to read a book for a book review, even though I have a big stack of them in my room. I had a new saddle fitter out for Oh So last weekend and she did a really good job getting his (Sam’s old) jumping saddle to fit better. Now with a new half pad and some flocking, it isn’t slipping anymore, so I’m happy we were able to find a solution for now. I’d still like to get him something custom fit, but I just don’t have the money right now. About a week and a half ago, we had planning meetings at The Chronicle. It was two long days of sitting in the conference room, but I had so much fun brainstorming with the whole team all in one room. It was informational to me to hear little bits of of how everything works and to hear other people’s processes and thoughts. It was also decided that I needed to do a holiday pets photo for our holiday issue, so with the help of my mom, we put together a couple of costumes for Toppers and Rocky (see above). We also discussed travel plans for the year and I’ll be heading to the Rocking Horse Winter II horse trials in Florida in February first. I’m excited since I’ve never seen eventing in Florida before. I’m also tentatively going to Jersey Fresh. Sam’s been feeling pretty good lately. I had a really nice ride on Saturday where we were able to do a lot of sitting trot, some half passes and even some walk/canter and canter/walk transitions, which I haven’t been doing lately because they can be quite demanding. Oh So has been going quite nicely on the flat and we’re starting to work on our flying changes a bit. I noticed that Fox Chase Farm is going to be hosting some CTs and dressage shows next year, so I’m excited to get going. Rocky turns 12 today. I can’t believe I’ve had him since he was 3. We bought him as a companion for Toppers and he’s become a member of our family.